Mr. Pawlish and i didn't do anything super exciting today, just ran a couple errands. the only major thing we needed was dog food, it's amazing how much two dogs put away! today we have the last of the China Glaze Hologlam collection... Galactic Gray (kindly provided to me for review!). it's a taupey greY with what is probably the strongest linear holographic finish in the bunch. this polish is just gorgeous! remember to shake the bottle up really well before use, and not to stroke over the same spot too many times during application to avoid balding. 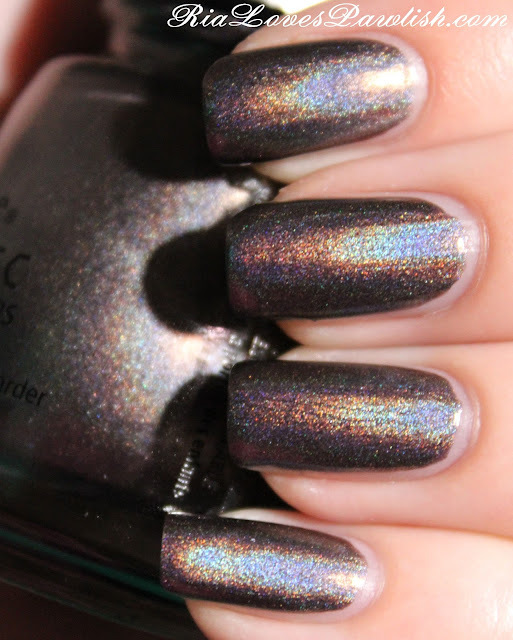 it's opaque in only two coats and looks perfect with a coat of shine topcoat... which doesn't dull the holo at all! two coats Galactic Gray, one coat China Glaze Fast Forward Top Coat (also provided for review!). it's really amazing in person!